I started taking a Pilates class recently at my gym. I’ve only really done Pilates by DVD, but I was excited to get into a live class. The room was packed, my daughter had finally started doing well at the gym day care, and I had high hopes for the class. The instructor asked if there was anyone new to the class and because it was my first time, I raised my hand. I thought that the instructor knowing it was my first time was a good idea. I thought that maybe she’d check my form as she walked around the classroom. Which she did. But she also cleared a spot for me in the front row of the class and made me plop down there. These types of scenarios are why people are afraid to join gyms and take group exercise classes, am I right? But I survived. Even though I’m a back-of-the-classroom, under-the-radar kind of girl, I survived it. And I did get some one-on-one attention from the instructor, which was helpful. Because Pilates? So challenging if you do it right and really focus. Speaking of focus, this instructor who called me up to front and center? She turned out to be…very demanding. I’ll just say that if she ever wants to be a boot camp instructor (in the military, not just the gym class), she would get hired immediately. When I think of Pilates, I think of a very calm, soothing, he-he-hoo-hoo-breathing type of instructor. Not this one. She isn’t afraid to stop the music and yell at us when she feels like we’re not performing up to snuff. She will clap her hands and scold, and basically scare the yoga pants right off of you. Even though the instructor isn’t the cuddliest bear, I keep going back. She knows what she’s talking about, and I like the challenge—even if it comes with some attitude. And her bad cop stopping of the music to point out our poor form is pretty helpful. We actually had a substitute instructor last week and I kept thinking, “Oh, we are being so sloppy! We should so be getting yelled at right now!” I was a little relieved she wasn’t there and yet…I kind of missed her. Great Post! I was worried about attending a group exercise class at my local gym but after attending, I really enjoyed it. It’s a great way to get in the gym and work up a sweat! When I went to a Body Pump class for the first time in about 4 years the instructor was both scary and awesome. She did every move with us which was great but she also didn’t miss a thing that went on in that room. More than once as I was pausing between reps she made eye contact with me and, though she didn’t call me out individually, suddenly felt the need to shout at all of us (encouragingly though). I definitely pushed myself harder as a result. Then last week I tried Zumba for the first time and we had two instructors that alternated tracks. One other girl and I had identified ourselves as newbies and so one of the instructors took it upon herself to come workout between us anytime she wasn’t leading. Again, made me work harder than I would have otherwise but also made me super self-conscious. Yeah, I resonate. I find that especially in Pilates it is important to have a demanding (yet supportive) instructor. It’s so easy not to do the work if you’re not in the right form. Congratulations for doing a good job in your pilates classes. Instructors are like that because they want to have the impression that they mean business at every class. 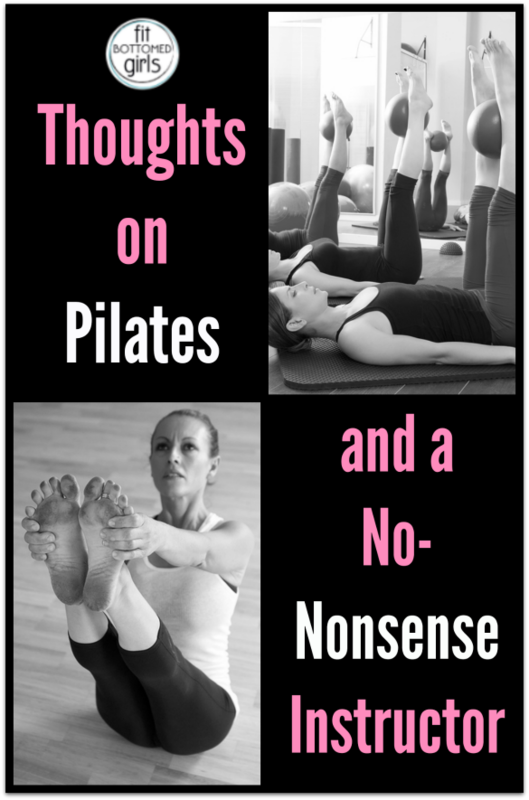 Besides, pilates is not easy and they want you to be in proper form. “the room was packed” was my first clue where this blog was going. Yoga, cardio “blasts”, spinning, zumba can all be done in large group settings, but Pilates should not. Pilates is based on a set of principled, controlled movements. When you have large group classes, you have age differences, flexibility differences, possibly people recovering from various surgeries, etc. One size doesn’t fit all, but glad the drill instructor took you to the head of the class.